unavailable cursors he swims up to you and releases them. I hope you like them. 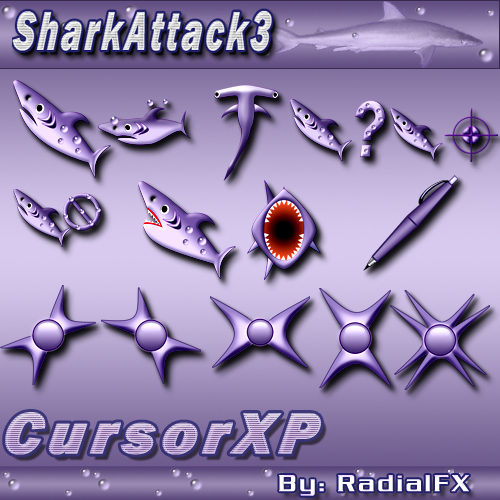 I loved your SharkBlues cursors and this purple version is just as great! Thank you so much! Hmmm I thought I would way prefer the blue over the purple but now that I see these... they look awesome! I am kinda partial to the purple ones!! Oh, so now we got a new underwater purple menace in addition to the blue one. Duh Duh Duh Duh Duh Duh! Is that the Jaws theme? If not,these cursors rock anyway! Thanks Radial, almost a horror theme. These are cool, but can you make one with the great white shark's natural colours? White belly and dark grey top.. that'll really scare people..
Me too. I love the bule one best!!! ^_^! muy bueno very good gracias!!!!!!!!!!!!!!!!!!!!!!!!!!!!!!!!!! !